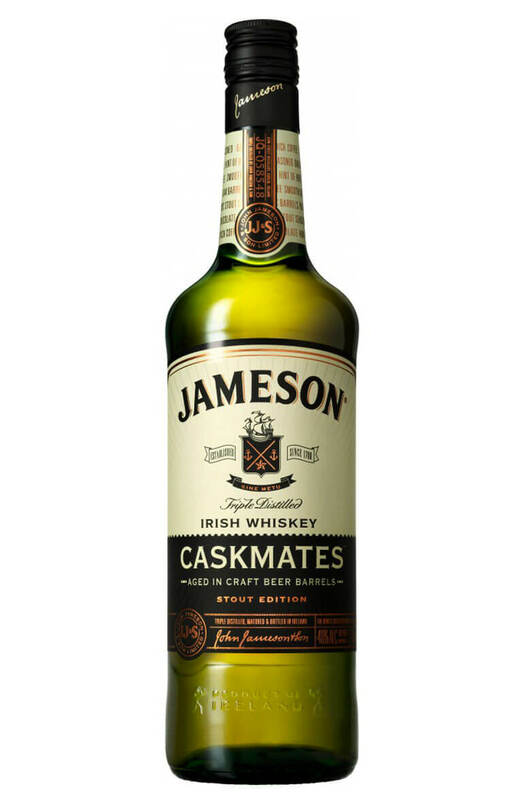 The Jameson Caskmates release is a unique whiskey that has been made with the help of Cork's Franciscan Well brewery. Barrels that had been previously used for Jameson whiskey were taken to the Franciscan Well Brewery to use in the ageing of their full-bodied craft stout. Once used for beer maturation they were sent back to the distillery where Jameson whiskey that had already been aged was filled into them for a finishing period. Nose The initial aroma of freshly mown Hay is complimented by a crisp Orchard Fruit character, Green Apples and Pears along with a twist of Lime Zest. Mild Pot Still Spices appear, deepening from Green Tea to Hazel Nut and Milk Chocolate. The lingering Hop influence combines effortlessly with Toasted Oak and Barley Grains to form a solid base. Types of Barrel used for Aging Standard mix of ex-Sherry, ex-Bourbon and refill casks followed by a finishing in craft stout seasoned barrels. Following on from the hugely successful Caskmates Stout edition comes this crisp and fruity tasting ..